The pump system is perhaps the single most important feature of modern sealcoating equipment. The pumping system is the heart of the operation and without it you are back to squeegee’s and brooms. There are basically two different types of pumping systems. 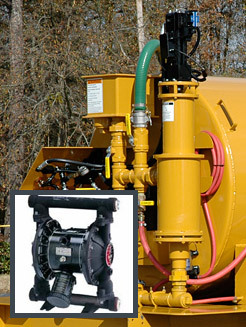 Air driven dual diaphragm pumps and hydraulically driven piston pumps. Both have been around since early in the history of sealcoating equipment and have served professional contractors well. With that in mind, It is important to know the capability of a machine’s pumping system, because its efficiency is closely tied to the amount of work you can do in a single day. Below are a few considerations when investigating a pump system. • How many gallons per minute (gpm) will it pump? • What is the maximum PSI (pounds per square inch) or pressure the pump will provide to the handwand or distributor bar? • How much downtime does the pump require - if any - during the process of a days work? • Will it pump sealer with sand in it or other modified sealers? If so how much can it handle? • How difficult is the pump to fix if there is a problem? Pump systems have other features and benefits you will discover while considering sealcoating equipment for your business. You will have to be the judge as to whether or not it is important to you and if it contributes to higher efficiency. On the other hand, you may choose a pump that has less overall efficiency but is sufficient for your company into the foreseeable future. Pump maintenance is also an issue. Piston pumps have very few parts but are heavy and more expensive. Diaphragm pumps are smaller and less expensive but have more wear parts to replace and maintain. A companies budget is also a real and practical consideration that cannot be overlooked and must be factored into the equation. There is equipment designed specifically for the budget minded contractor and it can be a great way to get started. Be careful however, inexpensive and cheap are not the same thing. Never buy cheap, unreliable sealcoating equipment.